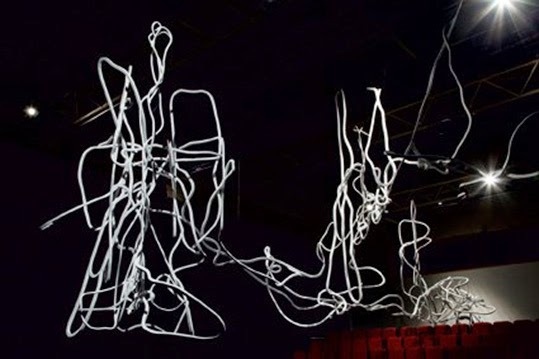 Before and After (2015), an expansive abstract sculpture by Miguel Ângelo Rocha (b. Lisbon, Portugal, 1964), is on show at the Calouste Gulbenkian Foundation’s Centro de Arte Moderna (Modern Art Centre), Lisbon. The piece, made in collaboration with musician Pedro Moreira, reflects on issues of time and materiality whilst also exploring links between drawing, installation, performance and sculpture. In dialogue with the pulsating score, twisting and turning narrow wood forms take shape within three large rooms, including a vast auditorium. 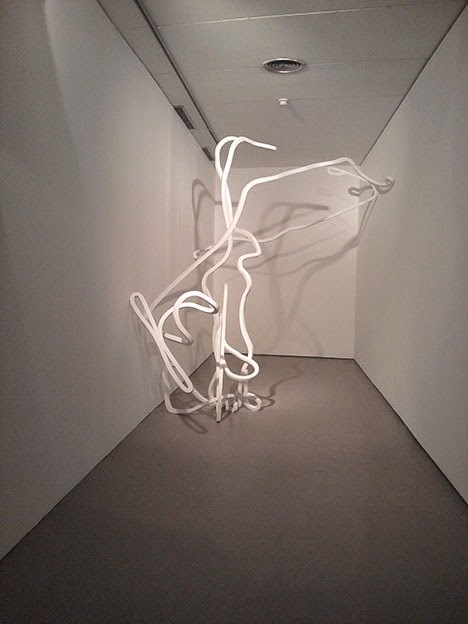 In the first two spaces the viewer encounters the white hollow wood structures set against a white cube backdrop. 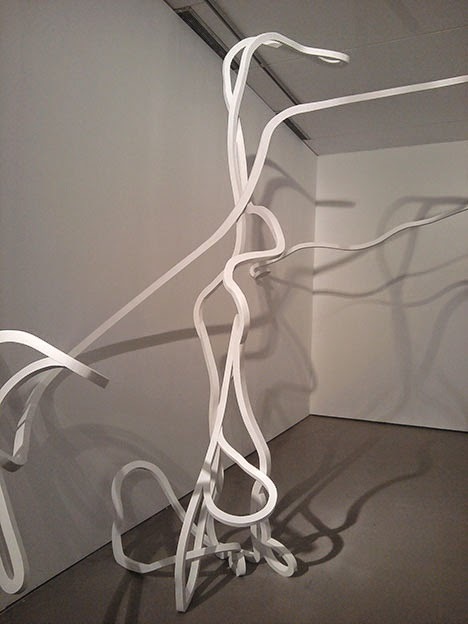 The work’s shadows reflected on the walls create an interplay between the flatness of the drawn line and the physicality of sculpture, amplified by the use of sound. The audio element, itself a ‘material’ component of the work, fluctuates between quasi-recognisable instruments and electrical crackling resembling acoustic feedback. 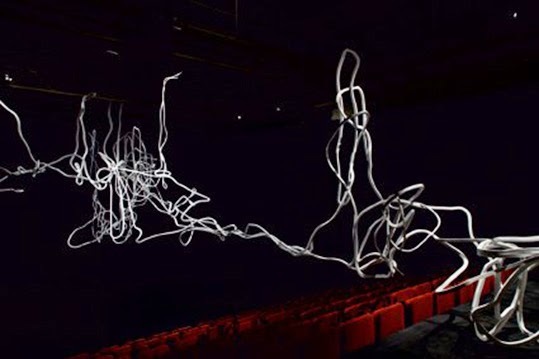 Sound adds a sense of temporality, particularly in the darkened auditorium as the musical score set within a space traditionally associated with a wide range of performances conveys the impression of walking into an act in progress. 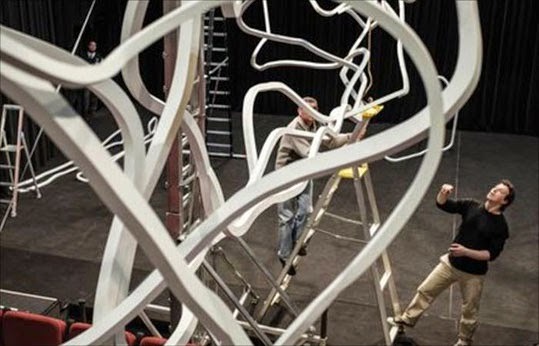 The sculpture’s three-dimensional physicality appears to come to life with its floating and meandering forms expanding from seats to stage. The wooden strands are therefore presented not only as a material object but are also temporal, intimately linked to the score and theatrical setting. With no actors on stage, viewers take on the role of both performer and spectator as they are given the opportunity to wander around the space. This makes for an immersive experience, placing the audience within an inhabited space. One cannot help but get the feeling of playing a minor role in a theatre production – an unknown story started before one’s arrival and which continues long after one has left the buidling. The use of the white rooms in addition to the auditorium is key in enabling the work’s theatricality to grow exponentially whilst also adding a site-specific dimension. 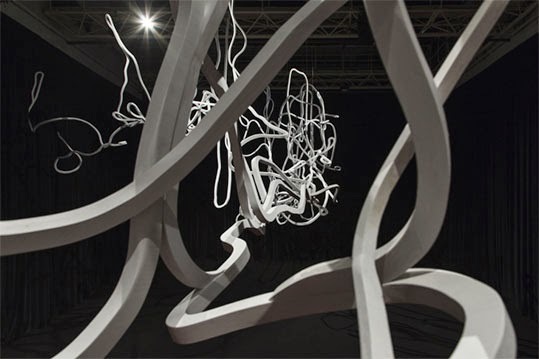 ArtworldNow visits Miguel Ângelo Rocha: Before and After from ArtworldNow on Vimeo.